Here are some Sunday morning thoughts from my Saturday night babysitting (I love hanging out with Ariana and family) and knitting adventures. 1. 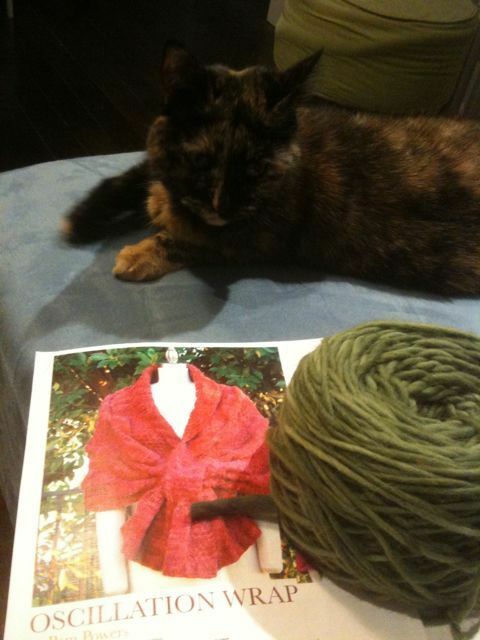 ‘a long tail’ is not an adequate word to describe yarn needed for a double cast-on for a new knitter. There must be some reference for how long a ‘tail’ should be relative to the CO stitches. If you know, do tell. 2. A row counter is a beautiful thing. Even after one row. 3. 70 stitches is considerably wider than my little cable scarf was. 4. The circular needle and I are still trying to get to know each other. 5. Thank goodness for re-run girly movies on TV, I didn’t look up from the needles once in two hours. 6. Pen and paper trumps yarn counter. They are going to have to learn to work together. 7. Shell-on pistachios are not a brilliant choice for a ‘hand-relaxing’ snack during knitting. 8. One day I hope to be able to knit and talk/ watch tv/ think/ multitask or anything else. I forsee a very antisocial knit night at my LYS this week. For your question about the amount of yarn to leave for the cast-on, I think the general rule of thumb is to figure on roughly three times the width of the finished piece.